The cheetah is the fastest mammal on earth. Everything about it is built for speed. During a twenty-second chase, its feet barely touch the ground as it reaches a top speed of 70 mph. Cheetahs were once widespread throughout sub-Saharan Africa, across the Middle East, and in India, Pakistan and Bangladesh. Today, that vast range has shrunk to very limited range in parts of Africa. Most cheetahs live in small, isolated groups on the fringes of protected game reserves. They are pushed there by more aggressive predators such as lions and leopards who dominate the game reserves. The largest concentration of cheetahs – 20% of the total wild population – lives in Namibia. Cheetahs tend to inhabit mixed scrub-savannah habitat where they can seek cover but also hunt in the open. Some cheetah also inhabit wooded or desert habitat. Cheetahs prefer to live where they can find plentiful prey and scarce competition from other predators. Cheetahs hunt during the day, which is unusual for cats. For them, though, it is one way to avoid conflict with other, more powerful predators. Cheetahs stalk their prey patiently, getting as close as possible under cover of tall grass before launching an attack. Movement by the intended victim triggers the chase.  Interestingly, a cheetah will not attack an animal that stands still. It will only spring to the chase when its prey starts to flee. Not surprisingly, the cheetah’s most important sense is sight, which it relies on heavily while hunting. After the high speed chase that lands a kill, a cheetah must recover before eating. It will rest and pant for about half an hour, then eat quickly and nervously before other predators arrive on the scene to compete for the kill. When challenged by lions or spotted hyenas, cheetahs usually back down and abandon their kill. When not hunting, cheetahs are sleeping, resting in the shade, or patrolling their territories. More often than not, male cheetahs live in groups of two or three while females live alone, unless with cubs. No other mammal species has this social dynamic. Male cheetahs are much more able to defend a territory when part of a group than when alone. Female cheetahs have overlapping home ranges but do not defend territory. As a general species characteristic, cheetahs are skittish and submissive toward other predator species such as lions and hyenas that may challenge them. However, male cheetahs are aggressively territorial and will wage significant battle with each other over territory and females. Males will mark their territory at least once an hour by spraying urine or defecating. They tend to have regular marking sites that they visit again and again. Cheetahs also make their mark on any ecosystem they occupy simply by being large predators at or near the top of the food chain. The cheetah’s main food source in the wild is Thomson’s gazelle. Wherever there are high concentrations of Thomson’s gazelle, there will be high density of cheetahs. In the Serengeti, cheetahs show a seasonal birth peak that appears to correlate to that of the Thomson’s gazelle. Lions, leopards, and hyenas will try to prey upon cheetah, particularly cheetah cubs. 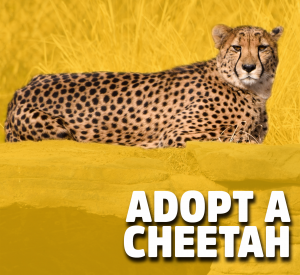 Because they are so fast, adult cheetahs are difficult to catch. Cubs are a different story. When first born, like all kittens, they are utterly helpless and can easily be killed in their nursery den while their mother is off hunting. Cheetahs are frequently killed by farmers and ranchers in defense of livestock. In Namibia, though, this is changing as ranchers are learning to coexist with cheetahs and to adopt other ways to defend their herds. Guard dogs and donkeys, for example, deter cheetahs very effectively. The cats defer immediately to these large, loud, aggressive and determined adversaries. A male and female cheetah meet very briefly to mate. The male then leaves the female and has no part in raising the cubs. After a gestation period of 90 to 95 days, the pregnant female gives birth to a litter of 3 to 6 cubs. Cheetah litters tend to be larger than those of lions or leopards, but infant mortality is particularly high among cheetahs. A cheetah mother will defend her cubs aggressively against small predators such as jackals and will do her best to fend off leopards and spotted hyenas. If a lion attacks, though, the mother cheetah may mock charge and vocalize but will probably keep her distance. Cheetah cubs nurse for the first six weeks of life but begin to tear and eat bits of meat as soon as their milk teeth erupt. Like other cats, cheetah cubs learn to hunt and kill by shadowing their mother. At about seven months of age, they can actively participate in the hunt. A mother cheetah will help her cubs along by leading potential prey to them and allowing them to make the kill. By about 18 months of age, cheetah cubs are proficient enough hunters to survive on their own. This is about when the family breaks up. The mother abruptly leaves, going her own way while the cubs stay together and fend for themselves. All of the cubs stay together until the females first go into estrus around age two. Sisters then leave to pursue solitary lives while brothers usually stay together. Cheetahs are listed by the IUCN, the world’s leading conservation site, as a vulnerable species. Today, fewer than 12,500 wild cheetahs survive, down from 100,000 a century ago. They are extremely rare anywhere in their Asian range and are increasingly rare in Africa, particularly outside of protected national parks. Human pressures are largely responsible for the cheetah’s endangered status. The combination of poaching, habitat encroachment (so that cheetahs are competing with stronger predators for less prey in a smaller geographic range than ever before), and extermination by ranchers are overwhelming the ability of the species to adapt and survive. There is hope for the cheetah’s survival, though, and that hope springs from human willingness to help save the cheetah. In Namibia, conservationists are working hand-in-hand with local farmers to show them how they can peacefully coexist with cheetahs. Rather than shooting cheetahs, farmers are relying increasingly on guard dogs and even guard donkeys to protect their livestock. Zoos are also an important link to saving the cheetah. 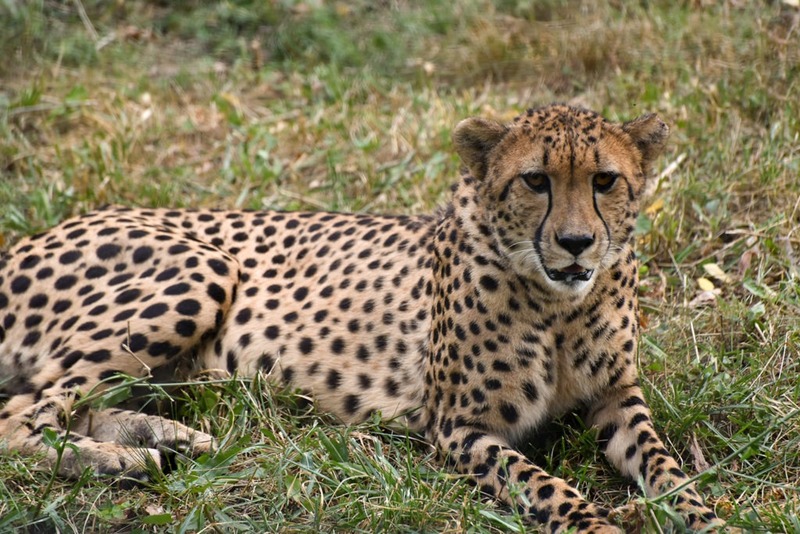 North American zoos that have cheetahs, including The Maryland Zoo, work cooperatively on research, conservation and education for the welfare of the cheetah. Educating people is critical. If local people in Africa come to see the cheetah as an asset in terms of promoting ecotourism, they will move forward into the next generation eager to save this magnificent cat and safeguard its future. You can make a difference for the cheetah. By supporting the Maryland Zoo, you support everything that we as an institution do, including research, conservation and education efforts on behalf of the cheetah. Fall 2006 Zoogram, “News from the Zoo” spread, p. 4. “Cheetahs know how to party,” special to The Baltimore Examiner, 5/28/2007, p. 36.